G-20 Confrontation: U.S. And China Have Shouting Match On Tarmac : The Two-Way Chinese and U.S. officials get into a shouting match on the tarmac, seemingly over where reporters traveling with President Obama could stand as he was exiting Air Force One. 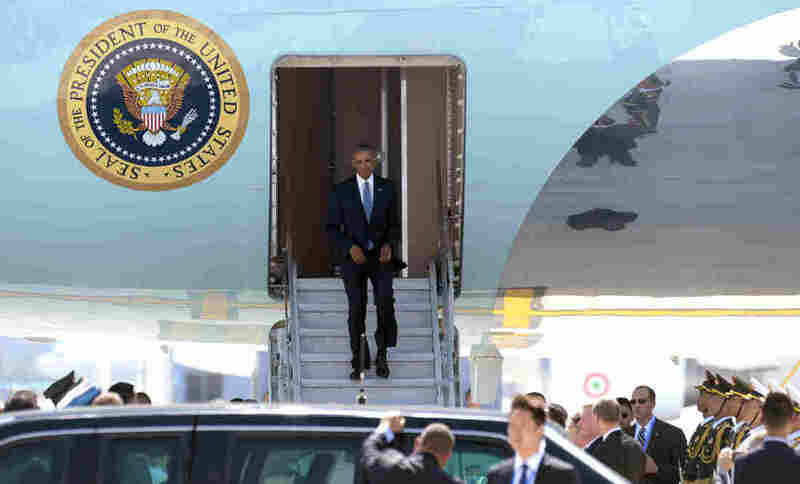 U.S. President Barack Obama disembarks from Air Force One upon his arrival at Hangzhou Xiaoshan International Airport in Hangzhou, Zhejiang Province of China. Obama's customary exit from the plane came not from the usual door high on the fuselage, but instead from a lower portal. It seems there were no higher stairs available to roll up to the usual door. The incident seemed to be part of a tug-of-war between the country's advance teams, which flared further over who would have the final say about where the U.S. press could be stationed during Obama's movements within the country. "Pool was brought under the wing of AF1 per usual but the scene was not per usual. There were no stairs to the top door to AF1, instead President Obama exited via the lower level stairs so pool could hardly see him, and only for a split second as he exited at 2:30 p.m. A member of the Chinese delegation was screaming at White House staff from the moment pool got onto the tarmac. He wanted the U.S. press to leave." And that's when an unnamed U.S. official stepped in. He yelled at another White House official and got testy with [U.S. National Security Adviser] Susan Rice and [Deputy National Security Adviser] Ben Rhodes, seeming to try to block them from walking closer to the arrival scene after they lifted the blue rope and walked to the other side of it, nearer to POTUS." Luckily, that kerfuffle ended without much incident and the president's motorcade was moving within a few minutes. In a subsequent pool report, there were details of yet another verbal altercation, and a scene where two Chinese officials almost came to fisticuffs with one another. It took place at a security checkpoint at Westlake Statehouse, ahead of President Obama's arrival. The report says American advance teams including White House staff, protocol officers and Secret Service agents, attempting to enter separately from the traveling press, engaged in "heated arguments" with Chinese officials for about 15 minutes. "U.S. officials could be heard arguing in Chinese with Chinese security officials over how many Americans could be allowed to go through security at a time. How many people the White House were allowed to be in building before the president's arrival. Which U.S. officials were on which list in a folder with a thick pile of name lists. "The president is arriving here in an hour," one White House staffer was overheard saying in exasperation. "As the disagreement escalated, a chinese official assisting the Americans grew angered by how guards were treating the white house staff and began yelling, nearly coming to blows with one of the chinese security officials. "You don't push people. No one gave you the right to touch or push anyone around," he yelled in Chinese at one of the Chinese security officials. Another Chinese official trying to help U.S. officials stepped between the two who were arguing once the security official began approaching, looking like he was going to throw a punch. "Calm down please. Calm down," pleaded a White House official. "Stop, please," said a foreign ministry official in chinese. "There are reporters here." Despite the turbulence, Obama and his Chinese counterpart, Xi Jinping, managed to announce that both nations will formally commit to the declarations of last year's Paris climate agreement to reduce greenhouse gases.